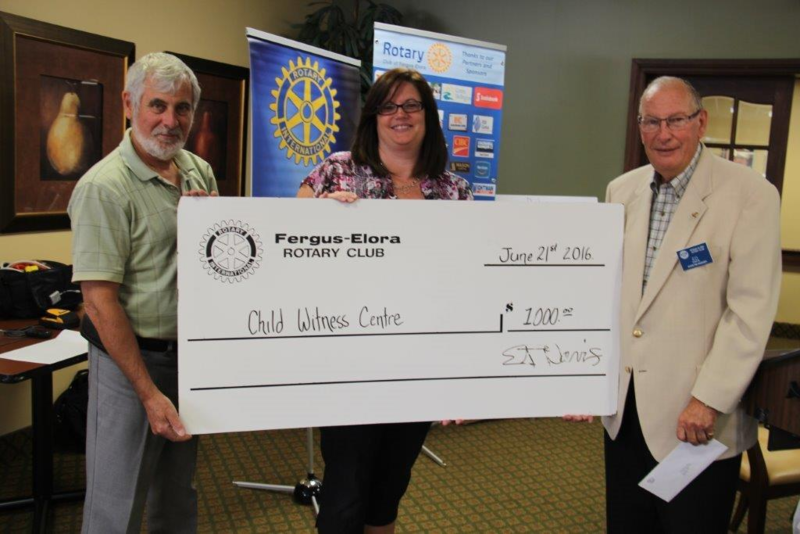 Past President Bob Wright and President Ed Davis present a cheque for $1,000. to Linda Mark of Child Witness Centre. Funds will be used toward their 2017 Youth Symposium for up to 1500 Grade Eight students and teachers in Guelph and Wellington County of which 230 are from Fergus and Elora. During the course of the day students and teachers have the opportunity to hear 3 inspiring speakers. Key messages include: You can be the change ! It takes ONE to make a difference ! Step outside your comfort zone and try new things ! Be an 'energy giver' not an 'energy taker' ! Students are given tools and strategies to help them face challenges in their own lives as they enter high school, a key point in their development.